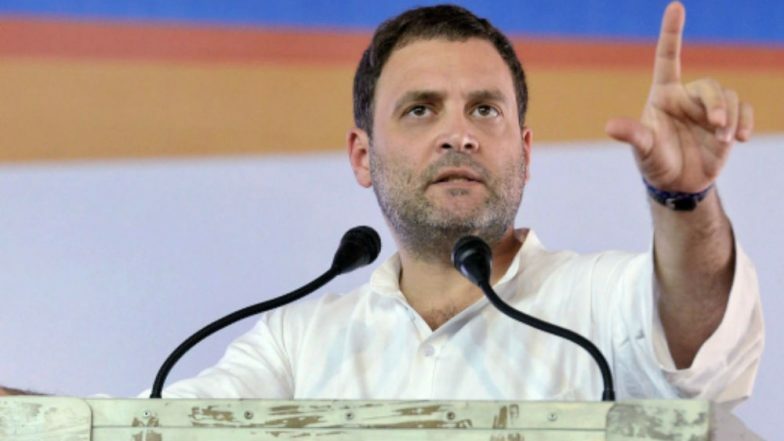 Kolkata, April 14: A scheduled election meeting of Congress President Rahul Gandhi on Sunday has been cancelled in northern West Bengal after the Darjeeling district administration denied permission to let his chopper land at the Police Ground in Siliguri, a Congress leader said. State Congress working President and the party's candidate for the Darjeeling Lok Sabha constituency, Sankar Malakar, said Gandhi was slated to address the meeting at Dagapur in Siliguri on Sunday. Rahul Gandhi Death Threat: Green Laser Originated From Congress Photographer's Mobile Phone, Says MHA. "These sort of problems are being created for all the opposition candidates. I will move the Election Commission," Malakar said. Rahul Gandhi Promises to 'Scrap NITI Aayog', Reinstitute Planning Commission if Congress Voted to Power.